We began this challenge last year — naming it #23Years23Deeds at the time — and we have chosen to continue the tradition annually. It’s now time to recap the year, the memories made with these incredible community organizations and the work done to support them. Thank you to the people and places that support our community. And thank you to anyone and everyone who helped us reach our goal of 24 deeds this year. Next up: Estipona Group’s silver anniversary. #25Years25Deeds begins Jan. 1, 2018. Stay tuned! We created a website for WACCS. Women in crisis need many things to help them take control of their lives and care for their children. As a marketing firm, we cannot provide most of those things, but we can build a website which makes the vital resources of the Women & Children's Center of the Sierra easily accessible to these families. So we did. Our inaugural 2016 Diaper Duty diaper drive for the Women and Children’s Center of the Sierra was such a hit, we did it again. So yes, this was Diaper Duty #2. (The poop jokes practically write themselves.) This year, we collected another 10K for babies in need. Read about it. When your focus is on advising your community on philanthropic giving, your own marketing can take a back seat. We helped the Community Foundation of Western Nevada get their own brand out of the back seat and into the spotlight as they work to make a profound difference in our community. We worked on our Spoker face. The Spoker Ride is a charity bike event that raises money for JDFR and Type 1 Diabetes Research. Since we are all about ending Type 1 Diabetes, we helped promote the event by creating an outdoor billboard (which posted on I-80) and developing and maintaining the website at SpokerRideReno.com. A group of Estiponies also rode in the event, helping build awareness for the cause. We filled their tummies (and nourished our souls). When families stay at the Ronald McDonald House in Reno, they are dealing with a child's serious health issue. A warm home-cooked meal is one way to comfort families during these emotionally and physically demanding times. This is the second year we have cooked for families staying at our local Ronald McDonald House. With a good deed that feeds our souls, we’ll be back again. We gave the Reno Huskies #UniformGoals. Kids on bikes is a good thing. Kids training together, racing as a team and working toward goals: even better. Shouldn't they look good while doing it? We couldn't agree more. So, we donated creative services for the Reno High Huskies’ Mountain Bike Team, designing racing jerseys and shorts, team t-shirts and a team tent. We embraced horsey business for the greater good. Horses that help the injured heal, the challenged learn, and the traumatized recover? This is one organization that doesn't horse around. (We crack ourselves up.) We created a Facebook campaign for Nevada Equine Assisted Therapy, designed to help build awareness for the community-minded organization. We embraced diversity so hard. We celebrated Pi Day (March 14, or 3.14, for the uninitiated) by creating "Pi(e) it Forward" Day. We baked and/or purchased pies (hey, no judgement here) for residents at Brookdale Senior Center and encouraged others to Pi(e) it forward to others. Read about it. We celebrated the arts with art. How meta. The arts are near and dear to us at the Estipona Group. As an extension of our passion for all-things-artsy, we helped found and brand the organization arts4nevada.org, which promotes Nevada’s rich and varied arts and cultural industry, provides resources for those in the arts and serves as Nevada’s advocacy center. We also developed an email template to help them better communicate with stakeholders. We played mini golf with major impact. We wanted to collect some serious change to help make serious change for our homeless population. So we went where charity fundraisers typically go — golf — and we turned the idea on its head. The result? Mini golf with costumes, beer, pizza, crazy handicaps and a group of good friends; in other words, we made it totally fun. Read about it and check out next year’s sponsorship opportunities. We blood-letted (is that a thing?) for a good cause. We helped Keep (the) Truckee Meadows beautiful-er. We teamed up with Keep Truckee Meadows Beautiful and Conscious Capitalism Northern Nevada to clean up a children's sensory garden at Idlewild Park. We filled our trunks with random stuff and gave it all away. We believe in de-cluttering for the greater good. Which is why we scoured our homes, closets, those of our friends and family (hopefully they're not reading this, because some we didn't tell) — and ultimately collected three SUV trunks full of gently used clothing and household goods to donate to the Committee to Aid Abused Women! Turns out, we might just be able to quit our day jobs — because we make pretty darn good food/beverage runners, if we do say so ourselves! Moon Rabbit Café is a pay-what-you-can community dinner, and our team took orders for a total of 150+ people in the basement of the Reno Buddhist Center. In addition to volunteering our time, we helped develop the theme for the August dinner and created a flyer and graphic for Moon Rabbit Café to promote the event. We shopped for a cause. We may or may not have an addiction to office/school supply shopping, which was put to good use during the month of August. As part of our birthday celebration (we turned 24 on Aug. 17 — HBD, EG! ), we collected donations of school supplies for Project 150, which supplies needed materials to area schools. Our goal was to invite revelers at our annual party to join us in donating to a good cause. And donate they did! There were no green eggs and ham, but there were party favors and treats for all during the Volunteers of America birthday party. For the second year in a row, the Estipona Group threw a birthday party with the VOA for local homeless children and their families. If you couldn't tell, we chose a Dr. Seuss theme, which resulted in lots of rhymes, made-up words and even Fox-in-Sox puppets. As Dr. Seuss himself once said: “Unless someone like you cares a whole awful lot, nothing is going to get better. It’s not.” We couldn't agree more! We performed a billboard-sized good deed. We offered PR assistance to the nuns. 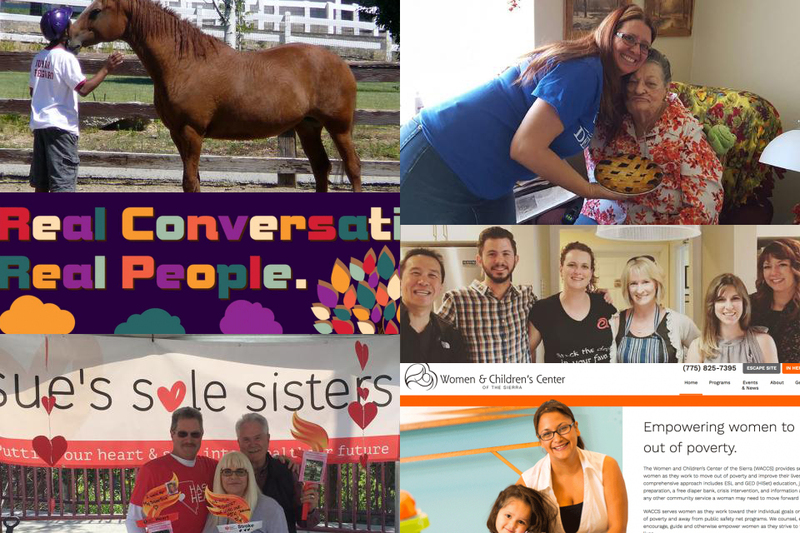 For the second year, Estipona Group helped promote Carmel of Reno's annual fundraising Open House through media relations and social media assistance. The 39th annual event offers an opportunity for visitors to tour the monastery grounds, meet the sisters and purchase Christmas and all occasion cards, as well as original works of art and musical CDs, all created by the Carmel of Reno sisters. We informed, inspired and delighted Reno youth (allegedly). We raised awareness (and funds) for a homeless shelter. Team Estipona joined some valued clients at the Volunteers of America Northern Nevada Shelter from the Storm fundraising breakfast supporting the shelter's homeless services. We totally held it together (sniff, sniff) — not really — during the powerful and inspiring stories from former shelter residents who have turned their lives around. With production-line precision, the team stuffed 320 bags of holiday meal fixings in two hours for Catholic Charities of Northern Nevada, setting a food pantry record (this has yet to be confirmed, but we're like 99% sure). We collected 66 pairs of PJs for local kids in crisis. As 2017 draws to a close, we ended our #24Years24Deeds campaign on a hopeful note. We imagine dozens of kids across our city snuggling into some warm, cozy pajamas they received from our jammie drive to benefit Project Sweet Dreams. We cannot solve all of our community's problems, but thanks to community contributions and donations from our team, we can all rest assured that we helped some foster children, homeless youth and kids battling cancer settle into bed with new pjs. And to all a good night. Good for you! Acting locally while thinking globally puts us all on the right path to solving the big problems of our times.